You must be a member of the New York Changemakers Group to attend this activity. Would you like to join this group? Join us to distribute much-needed hygiene essentials to homeless children in New York City! 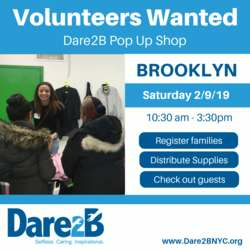 Dare2B, Inc. serves as a philanthropic agent for good focused on educating and empowering homeless children to break the cycle of poverty. Only people who sign up via the above link will have a confirmed spot. We look forward to making an impact with you.